Sedona Open Control Reference Manual. In this comprehensive reference manual regarding Sedona Framework, components from Tridium-release kits are explained along with Contemporary Controls’ hardware-independent and hardware-dependent kits. Examples are shown on how components can be configured and linked to create applications. Presentation: Understanding Sedona 1.2 Components – this presentation uses Workbench as a Sedona tool to demonstrate how components in the various kits can be linked together to facilitate the building of applications. White Paper: Creating an Open Controller with Sedona Framework, which promotes Sedona Framework as the best hope for creating a truly open controller based upon readily available technology and a Sedona community of developers and integrators. Presentation: BAScontrol Series of BACnet/IP Controllers: Using Sedona to Create an Open Controller , which explains our vision for using Sedona Framework to create an open controller. The BAScontrol Series utilizes a powerful 32-bit ARM7 processor with 512 kB of flash memory plus a 16 Mbit serial flash file system for storing configuration data and an application program. By operating at the BACnet/IP level, the BAScontrol20/22 can share the same Ethernet network with supervisory controllers and operator workstations. Each unit can be configured for a fixed IP address or can operate as a DHCP client receiving its IP address from a DHCP server. A real-time clock with a super-cap backup allows for creating local schedules. A 10/100 Mbps Ethernet port supports protocols such as BACnet/IP, Sedona SOX, HTTP and FTP. Configuration of universal inputs and virtual points can be accomplished using web pages. Type II and type III 10 kΩ thermistor curves and a 20 kΩ thermistor curve are resident in the unit. Current inputs can be measured using external resistors. Contact closures require a voltage-free source. Binary inputs and outputs as well as analog outputs require no configuration. The unit is powered from a 24 VAC/VDC source. 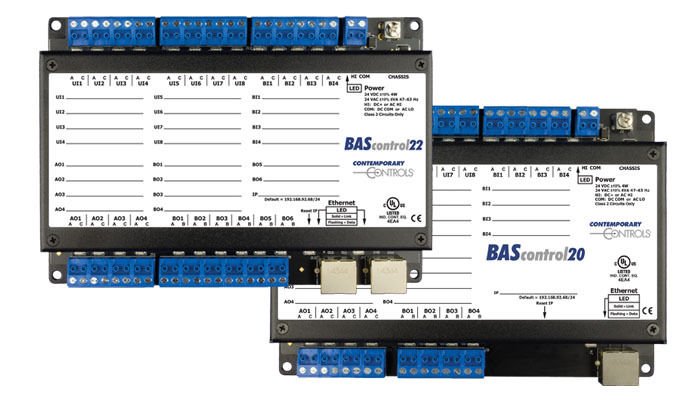 Contemporary Controls has developed the BAScontrol Toolset, which simplifies controller programming and project archiving for the BAScontrol Series and the BASpi. The following tools are included in the BAScontrol Programming Toolset. The Sedona Application Editor (SAE) is the Sedona tool used to create custom applications in the Sedona environment. Using graphical means, components residing in kits are dragged onto a wire sheet, configured and interconnected with other components to create applications. By keeping the kits database updated with the latest kits, SAE can program any model within the BAScontrol and BASremote series of controllers. Learn more. The BASemulator is a handy utility that works in conjunction with the Sedona Application Editor (SAE) and BASbackup - BAScontrol Project Utility. BASemulator can emulate on a Windows PC the operation of any of the controllers in the BAScontrol series - BAScontro20 and BAScontrol22. All real, virtual and web points including Sedona logic in a BAScontroller can be viewed with SAE as if it was the actual controller. All web pages used for displaying point status and for configuration appear on your web browser as if it was the actual controller. Learn more. The BASbackup provides a convenient way of storing and restoring a BAScontrol project to a desktop or laptop computer. Although you can store and restore a Sedona application with the Sedona Application Editor, a BAScontroller has IP addressing and BACnet configuration files that are unrelated to Sedona. With BASbackup you can save both Sedona application files and configuration files on the BAScontrol making a comprehensive copy of your BAScontrol project. Learn more.